Blue-tailed Bee-eater is always in our wish-list due to its striking colors. Many time we were mistaken Blue-cheeked Bee-eater as Blue-tailed Bee-eater. One of our birder friend Mr. Haresh Pandya from Palanpur upload Blue-tailed Bee-eater pix in FB group. I immediately called him and asked that he is sure about Blue-tailed Bee-eater. He is 100% sure and suggest us area of Blue-tailed Bee-eater, where they saw it. Next morning we started our journey towards suggested place. We encountered so many Bee-eaters but they all are Green Bee-eaters. We tried hard to search Blue-tailed Bee-eater but did not succeed to locate them. In the end it was afternoon, while returning to home we heard call of Bee-eater and its somewhat different. Finally we saw 5 birds in flight and they were perched on a tree just in front of us. These Bee-eaters are so beautiful, most beautiful is their remarkable blue coloured tail. We observed them over next 3 months and captured their amazing movements in camera. We will upload their full report soon. 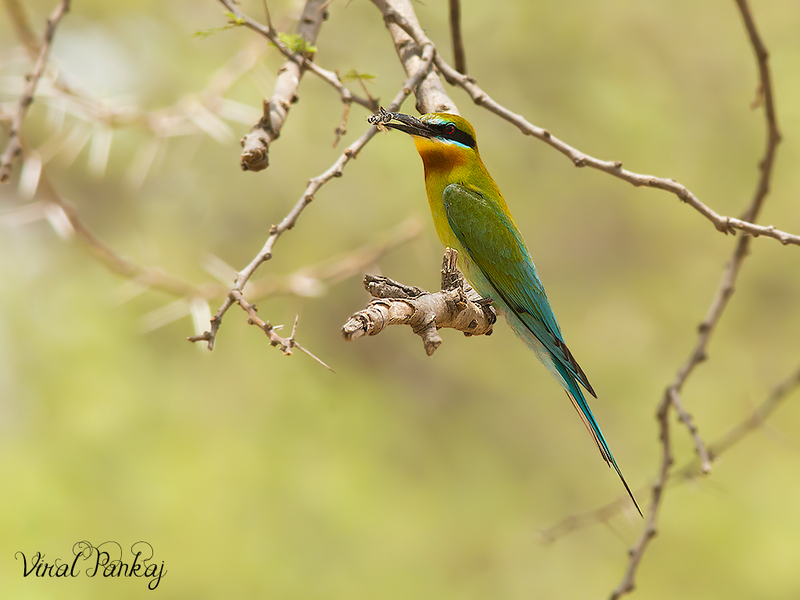 Till than enjoy Blue-tailed Bee-eater image..